We had this little planter sitting around the house for a while. It was a Goodwill find from about 10 years ago. I picked it up because it was just odd enough to fit in my decor at the time (less mid-century, more eclectic). Eventually the succulent I had in him died and my wife took him to her office, where she put rocks in him because she can't keep plants alive either. I forgot about him until I was reading through some older Rhan Vintage posts and saw that they had a similar one for sale and a magazine ad for them from the '60s. 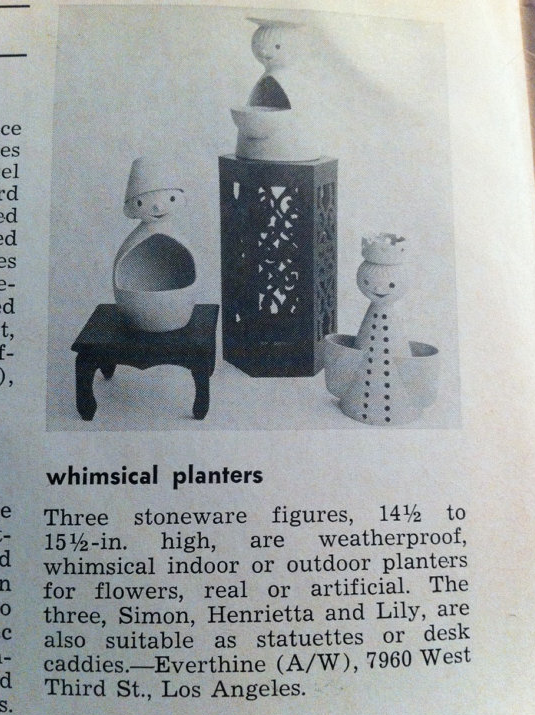 I've just been referring the planter as the "gnome planter", but apparently his name is Simon and he was made by Stoneware Designs West of California. All three of the planters are commonly called West figural planters, if you happen to be in the market for one now that you see how cute they are.